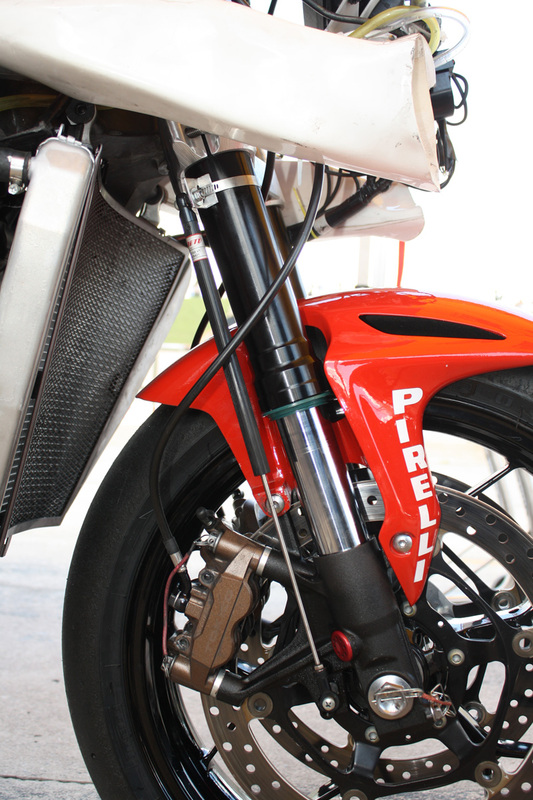 The fork potentiometer on this Ducati superbike is mounted in front of the fork tube with the exposed portion nicely protected by the front fender. For accurate, usable data it’s important to use good-quality suspension potentiometers intended specifically for data acquisition. These suspension potentiometers live a hard life exposed to the elements, and are subject to extremely high shaft speeds; look for units that have good specifications for resolution, repeatability and operating speed. We have had good success with the units offered from AiM, but there are others available. Another important consideration for good suspension data is the sample rate of your base unit. While it’s possible to obtain useful suspension travel data logged at 100 Hz or even 10 Hz, if you wish to perform frequency or velocity analysis you will need to log potentiometer data at 200 Hz or higher. Wheel travel often exceeds velocities of 300mm/s, and a slow sampling rate can cause plenty of information to be lost. Here, the potentiometer is mounted behind the fork tube. The top mount is fastened to the upper fork tube with a hose clamp below the triple clamp; changing ride height will not affect the pot’s calibration, but it must be either disconnected or – a safer option – completely removed to take the fork tube out. For the front fork, use a potentiometer with a stroke at least 10mm longer than the fork’s travel. In most cases, this will mean a 150mm pot. Mount one end of the pot to the axle clamp at the bottom of the fork, with the exposed portion at the bottom where it will be shrouded by the fender as much as possible. Mount the other end to the upper fork tube or the bottom triple clamp. 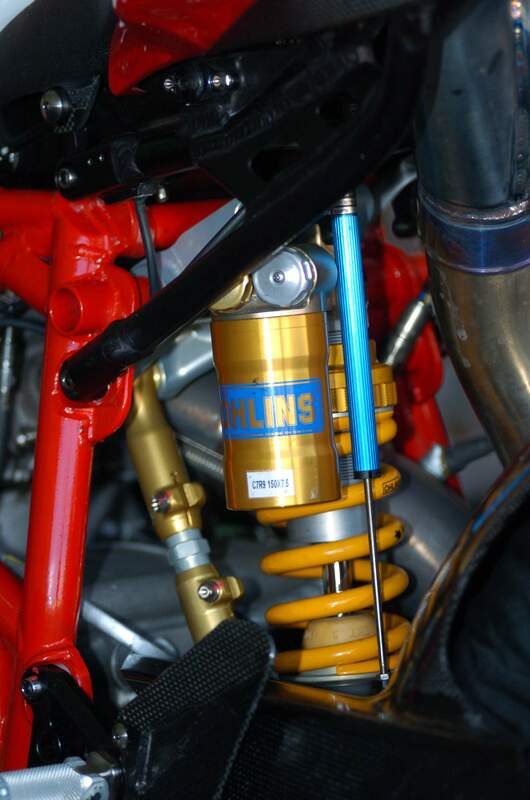 Be sure that there is at least a few millimeters of extra travel available in the pot when the suspension is fully topped out and bottomed out; keep in mind you may have to manually extend the fork to ensure the top-out springs are fully compressed. If you mount the top of the potentiometer to the triple clamp, the benefit here is that, if you remove the fork tube, you can simply unfasten the lower mount and leave the pot with the bike. However, if you change ride height by moving the fork up or down in the triple clamp, you will have to re-calibrate the potentiometer. Conversely, when the pot is mounted to the upper fork tube, you can freely change ride height but removing the fork tube requires the potentiometer to be completely removed or disconnected. While this is not a large discrepancy, it’s worth noting because it can have an effect if you look at data such as wheel load, pitch, and so on, and when actual suspension data is compared to any theoretical calculations you may use. At some point, you may want to consider calibrating the fork pot as a custom sensor, or creating a separate math channel for actual wheel travel. There are many options for mounting the rear suspension potentiometer. Typically, the pot is mounted directly to the shock absorber where it can directly measure shock travel and is safely out of harm’s way. On most single-shock bikes, a 75mm pot will work fine with this installation. 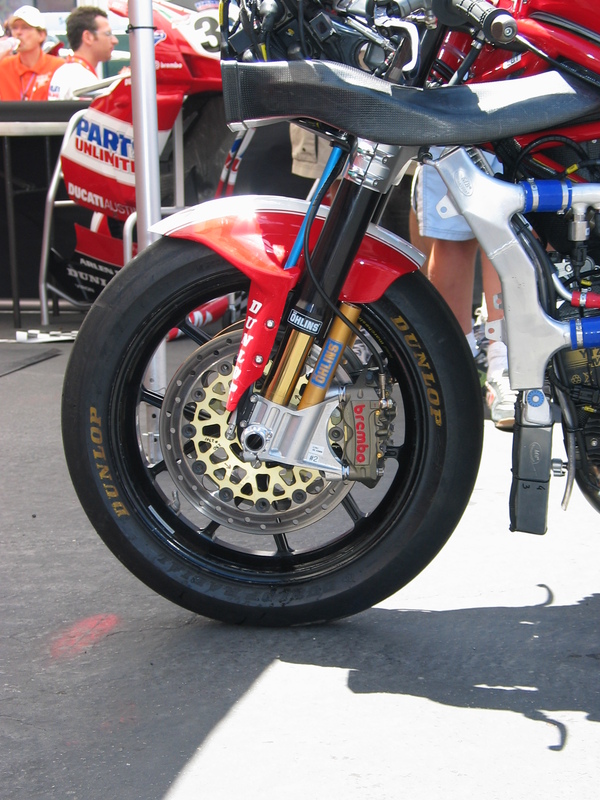 Other options include mounting the pot directly to the swingarm and frame, either midway between the swingarm pivot and wheel or close to the axle (where you will need a correspondingly longer pot). Due to space limitations with this Honda CBR1000RR’s Unit Pro-Link rear suspension, the potentiometer was mounted directly to points on the frame and swingarm; while the exposed portion is mounted to the frame, leaving the pot’s wiring connection to move with the swingarm, this was felt to be the safer option to protect the pot from the chain.. In this case, the linkage can be changed with no consequences to the calibration, but the pot must have its zero-point set if ride height is changed. In almost any rear suspension application, you will have to relate the wheel travel to suspension pot travel for accurate suspension data. When the pot is mounted directly to the shock absorber and you know the characteristics of the linkage, you can use a math channel to calculate wheel travel from pot travel. With any other mounting, however, it’s best to manually measure output voltage of the pot at a series of wheel travel measurements. Measure wheel travel at increments of 10mm, noting pot voltage at each step. Depending on your software package, you may be able to enter this data to create a custom sensor, or make a look-up table and a separate channel. 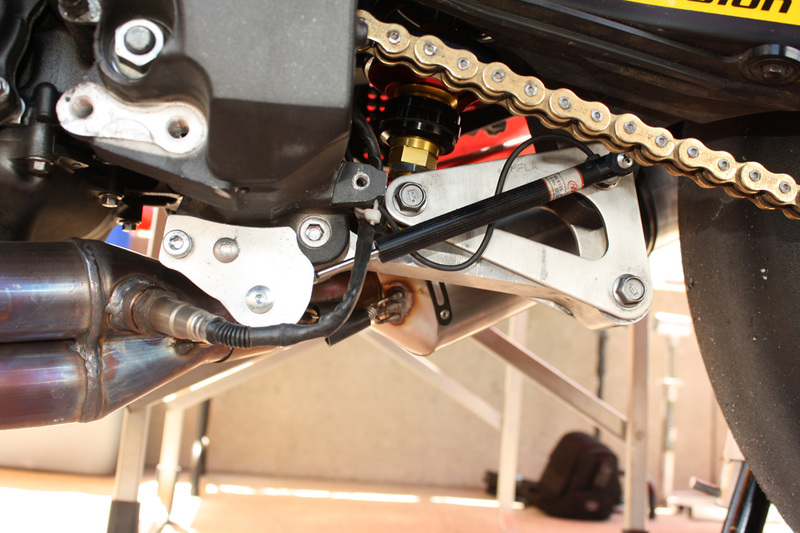 Again, depending on how you mounted your potentiometer, you may have to re-calibrate your sensor if you change ride height or the linkage, and be sure the suspension is fully topped out when you zero the channel.